Scottish political leaders TV debate for the UK general election 2010 to be held on 6th May 2010. Alex Salmond and the SNP defend the rights of Scottish voters from London based parties. 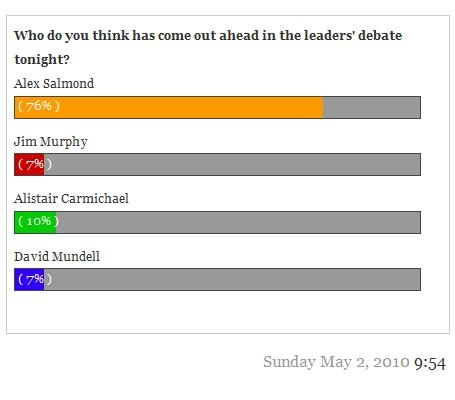 STV polls for Scottish TV debates. Election 2010; are the BBC Biased? 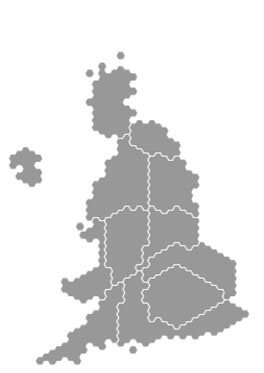 Following the scandal of the gagging of the SNP at the Leader's Debates by their exclusion, arranged for us by Westminster's London based parties in cahoots with their Mass Media Mind Washing Machine, including the BBC; Can you guess what that is on top of England? The BBC declares to be unbiased towards Scotland yet look how it portrays Scotland as a mere pimple on England’s back in its 2010 Election seat calculator. In 2005 Westminster culled our 72 Scottish MP's to 59 whilst increasing the number of English MPs from 529 to 533. Thank you to the BBC for providing a great service to the Nation of Scotland. The point of this article is not really the perfectly correct 59 seats on the political map, but to highlight that the map visually illustrates the amount of TV coverage Scotland's third largest party the SNP were allowed by the BBC over Scotland's smallest party the Conservatives. Scottish public services face £35 billion cut over next 15 years, as a non Independent Scotland will give London a minimum of *£225 billion (*based on this years revenues) over the next 15 years in oil and gas revenues alone. Full story on these Scottish Public Services budget cuts. VOTE for a SNP MP who will fight the £35 Billion planned cuts. After all it is Scottish Oil and Gas revenues (worth £1.2 trillion) that are stopping the UK debt being junked. The European Union costs every UK Citizen £234 a year. The UK Union costs every Scottish resident £2300 a year. Westminster wants to keep the American's sweet by spending £100 billion, they cannot afford, to renew Trident. Whilst the Trident submarines based a Faslane have now leaked untreated nuclear waste into the Gareloch over 40 times. If Faslane was a nuclear power plant it would have shut down by SEPA. Westminster also plan to close the submarine base at Plymouth and relocate all the nuclear submarines to Scotland? Scotland is the World's leading producer of wind energy, this energy will bring in more revenue and development opportunities than oil and gas. Vote YES YES and stop the Conservatives getting their hands on yet another "get out of Labour's jail card". 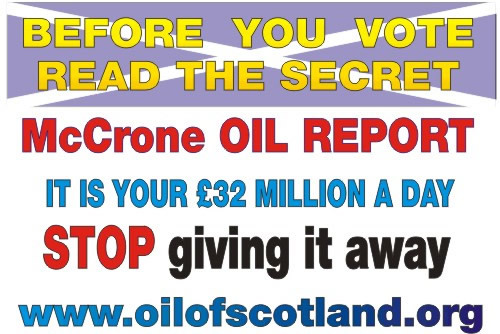 Scottish Oil is worth £22,831 a minute, £32 million a day, £12 billion a year. The most recent Government Expenditure and Revenue Scotland (GERS) figures - without oil and gas revenues demonstrate that Scottish public finances ran current budget surpluses in each of the three years to 2007- 08, totaling £2.3 Billion. In comparison the UK ran a budget deficit in each of those years totaling -£24 Billion. Scotland could provide enough Green Energy to supply a quarter of Europe. Attracting companies to relocate to Scotland in exchange for low cost energy. 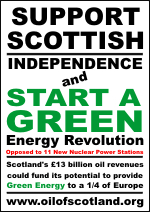 However Westminster is unfairly charging Scotland for supplying green energy. In 2005 Westminster culled 13 Scottish MP's from 72 to 59 while increasing English MP's from 529 to 533. This is a site produced by the Scottish People for the Scottish People to inform their fellow residents of the political injustices past and present inflicted on Scotland by Westminster and the London based political parties and institutions. Westminster does not want Scotland have the vast wealth of its economy which without oil and gas revenues was + £2.3 billion surplus over the last three years opposed to the UK's - £24 billion defict! 12 APRIL 2010 The SNP launch their 2010 election manifesto. The SNP cares about Scottish success. Here at home, and in the parliaments in London and Brussels, our focus is first and foremost on economic recovery and jobs for families and communities. We know Scotland’s got what it takes to weather the current economic storms and recover strongly – and we are working hard to make this happen. Scotland's prospects could have been so different, if Westminster had not overturned the 52% Yes Vote in the 1979 devolution referendum. If the English Controlled Labour Party had not made this unfair and undemocratic decision, the Scottish could have been asked to vote on Independence years ago ! The case for Scottish Independence is very simple. 1. Full Control - opposed to No control to the 12.8 Billion that Scottish oil and gas generates in revenues, that is £2300 for every man woman and child. Scotland, the only Country in the World to strike oil and stay poorer? In the last 30 years the Scot's have handed another Countries Government well in excess of £250 Billion revenue from Scottish Oil and Gas, that is £48,000 for every man woman and child who is older than 30 year old. Add to these figures the revenue that Scotland would make from supplying Green Energy to a quarter of Europe. However the powers that be in Westminster are not keen on the idea and have elected to build another 11 nuclear power stations instead. 2. A Scottish voice in World Politics ? In a Independent Scotland, Scotland's 59 MP's would not have to share an eleventh of the political table with other Countries decision makers. 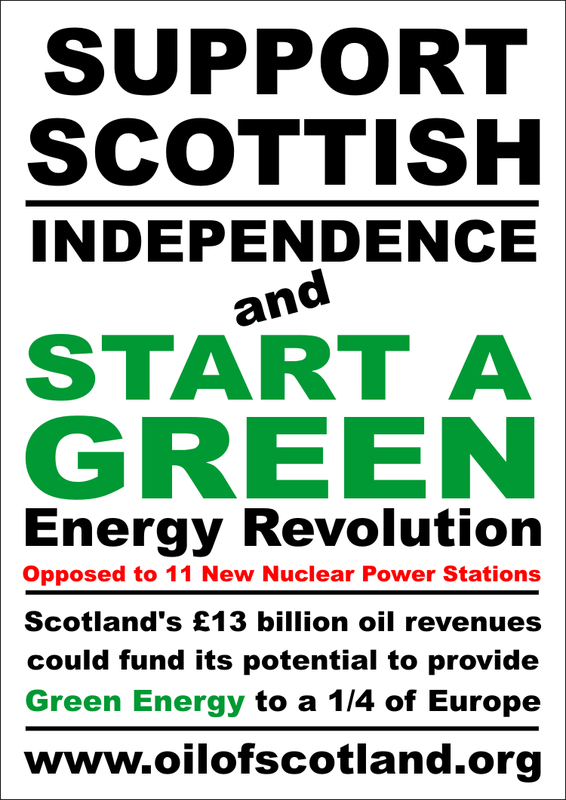 If Scots were in control of there oil and gas revenues they could erect 16 wind turbines a day. Bringing yet another "World's largest wind farm" with another 15 days of Scottish Oil Revenues. At the Copenhagen Summit. No representative from the devolved Scottish Government was allowed to attend this important summit for all our futures. Which is pathetic considering Scotland has the capacity for create enough green energy for a quarter of Europe. Scotland also has the cash to do this if it was in control of its North Sea oil and gas revenges. The SNP can if enough Scot's vote for them stop the UK economy spiraling into more debt. By halting the £100bn Trident upgrade. An upgrade which is ILLEGAL under the international nuclear non proliferation treaty. In true MOD fashion, there are reports that these new ballistic missiles will not fit into the current submarine launching tubes as they are too small. What a shameful and immoral waste of tax payers money! Trident nuclear submarines based at HM Clyde Naval Base at Faslane have leaked radioactive coolant into the Gareloch at a serious level three times. or read the facts about Trident - Faslane and the Jobs that may be lost. What the papers have to say on Faslane leaking nuclear submarines at Faslane that have leaked untreated radioactive coolant into the Gareloch more than three times. Westminster want to close the nuclear submarine base at Davenport and move the entire the UK's nuclear submarine fleet to Faslane. If all the streams in Scotland were converted that would be enough power for 300,000 homes a day, which is about 54% of Scotland's electricity requirements. The small cost of these projects could be bourne by the either the Scottish Government or the farmers who own the land. With green energy grants now at 10p a Kw that would equate to £90 a day, £32,850 a year for a project generating 900 Kw of electricity. Which could be healthy boost to Scotland's farming communities and Scotland's hydro turbine and construction industries. Based on a setup cost of £106,000 per stream hydro project, two day's of Scottish oil and gas revenues at £32 Million a day could pay for all 600 projects. 7. 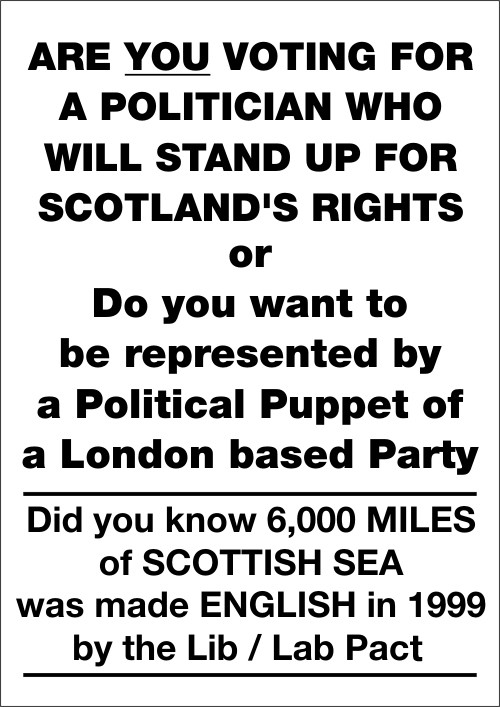 In a Independent Scotland, the Scottish Labour Party / Conservative Party / Liberal Party would be controlled by Scots and not English Puppeteers. Allowing them to concentrate on Scotland's 5 Million population opposed to leaving the plight of the Scottish people to the English who have 55 million of a population to please to keep the 523 English seats in Westminster. 9. In a Independent Scotland nothing much would change ~ same Monarch - postal system - rail networks - prisons - same money - same local taxes etc ~ The Population of Scotland, could still, if they prefer refer to themselves as Britons or British. As British Isles are the name of a landmass not a Country. 10. Scotland would be able to have full control over its revenues and not be ripped off ~ for at the moment Scotland is short changed by (2.9 Billion 2005 - 1.8 Billion 2006) form what the GERS report says it has been given. 11. The Union has severed it purpose now it is also a financial liability, in 1979 52% of Scottish voters said YES to a Devolved Scottish Government, Labour said NO then 43 to 19 Scottish MP tried to repel Westminster undemocratic NO decision and again were told No. Once again Labour have been successful in putting the United Kingdom into recession with £750 billion pounds of debt which is could to rise to £1.4 Trillion. This debt equates to every new born child owing over £17,000. Servicing the interest on that debt will be more than the cost of educating the child, more info. However Scotland could be debt free in 5 years. If the people of Scotland vote for Independence in 2010 the amount of that debt that would be attributed to Scotland would be reduced to £62.5 billion, as Scotland's population is a twelfth of the size of the United Kingdom. = £62.5 Billion (divided by) £13 Billion Oil and Gas Revenues = 5 Years and Scotland could be free of debt. 30 years after the oil started coming ashore Norway has created £259 Billion social wealth fund. This social fund could easily cover the UK deficit of £175 Billion. In the General Election, set for March 2010, the Conservative will more than likely be elected, despite labours efforts to convert Scot's voters for their own personal and political gain on the opposition benches of Westminster. In Scottish Politics it has been the "anti Scottish" Labour Party who have been holding a smoking gun against the heads of a lot of people in Scotland who are misled into voting Labour. This gun has been repeatedly loaded with lies, discloser, spin and unfounded SNP smear campaigns. 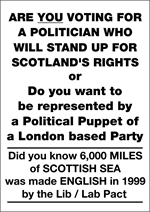 Did you know that in 1999 The Labour Parties made 6,000 miles of Scottish Sea English. The Labour party also overturned the will of the Scottish People who wanted a devolved Government in 1979. In this 1979 Referendum 52% of Scottish voters said Yes to a devolved government. (32.7% of the Population) - To elimate any chance of a devolved parliament the labour party imposed a 40% of the population must say yes ruling. However if the entire population had voted the same way which was unlikely by the Labour Parties fondness of disclosure of forth coming elections. More than 52% not 40% of the population would have said yes. In today's society the Labour party have similar ideals to the Tory parties. Which are to line their own pockets and the pockets those in power and lie to the population about the economy, the massive mistakes and the need to start international wars. In the 80's the Conservatives brought Britain back from the brink of bankruptcy with the bonanza of oil revenues plundered from Scotland. This money from oil would be better spent. This money equates to an additional £2300 per year for every living person in Scotland. Norway the only Independent Nation extracting oil and gas from the North Sea. Has manage to build up a £259 Billion Sovereign Wealth Fund while the London Unionist parties at Westminster have manage to get Scotland £62.5 Billion in debt. In modern times the Scottish Economy has alway been in the red. Once Scotland got it's Independence, We are sure the people of Scotland would not mind if the Union Joke, sorry Union Jack still remained as icon for the British Isles, to avoid having to change a lot of computer systems. As Her Majesty the Queen is also the Queen of Scotland, the Monarchy would also in not be jeopardy as Union of the Crowns would still exist. Therefore Scotland becoming completely politically Independent from Westminster would not affect any Royalist / Loyalist ideals, what so ever. Would Scotland survive on its own - "Conservative leader David Cameron thinks so"
Scotland could afford to train its work force with real skills for real jobs. Current funding does not allow this. The number of Scottish owned firms could have been increased. If Scotland had become independent every large Corporation i.e. all supermarkets wishing to operate in Scotland would have to build a Scottish Head Office to operate from. The Scots would have stopped Scotland becoming a nuclear dustbin. The powers that be in London would not be secretly trying to dump 250,000 tonnes of radioactive London 2012 Olympic waste in Falkirk. The Scottish Government do not want to foot the £100 Billion bill for replacing Trident. The Nation of Scotland could be closely governed by a Scottish Government opposed to a Westminster Government based in London ~ England. This could have been the case regarding the Scottish Banking industry regulations and the politically advantageous, HBOS Lloyd's TSB merger. The Nation of Scotland has a population of 5.17 Million opposed to the population of the UK 60.5 Million. Therefore a Scottish Government with full control of the Countries substantial resources could devote more attention and money to its citizens. This is why since devolution NHS Scotland has made the Scottish service superior to the service offered in other areas of the United Kingdom. Scotland's MP's would not have had to put up with the prospects of a 11-1 Westminster defeat if they all agreed on opposing an anti Scottish policy, brought before Westminster. Like the secret 1999 order to move Scotland's Marine Boundaries from Berwick-up-on-tweed to Carnoustie, making 6,000 miles of Scotland's sea, English Sea. Scottish Politicians and through them the Scottish People could have a voice in the European and indeed the World stage. 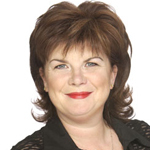 This Scottish voice could possibly have made a significant difference in European and World Politics as well as environment issues; as Scotland is Europe's Largest Oil Producer. The Scottish people could have been rallied by a Scottish Government to deter crime at the source "a disillusioned population especially in the young" and convince them that if they contribute more to the community it would be for the better good of themselves and Scotland. The SNP have identical policies to the Liberals with the exception of Independence ? As a political force the main aim is Independence, however they also fight for what is the best for the Scottish People, not an easy task when you up against the might of Westminster !!! Non English speaking residents of Scotland please use this translator.